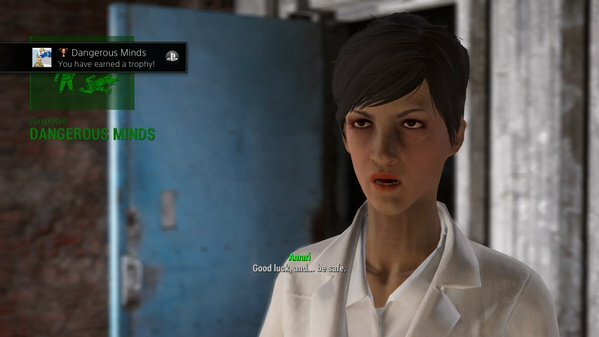 - Once you’ve completed Dangerous Minds you’ll receive The Glowing Sea. During the introduction of this quest Dr. Amari will talk about the intense radiation in your next destination; you may, therefore, want to grab the small pile of RadAways and Rad-Xs off of her desk before you leave. - Head upstairs and speak to Nick. He’ll discuss the Glowing Sea with you a bit, and offer to come along since he’s immune to radiation. Bring him along or ditch him as you see fit. Regardless, you have some considerations to make before you enter the Glowing Sea, in the southwest corner of the Commonwealth. The Glowing Sea is an extremely hazardous area. Not only is it constantly plagued by Rad buildup that will sap your strength, it’s patrolled by some extremely nasty beasts, all of which inflict more Rad damage whenever they successful hit you. You need to protect yourself against the Rads to stand a chance of getting through. Here are some tips for doing so. Do as Nick suggests and bring someone along. More muscle means less time spent on combat. Take the Rad Resistant Perk. By level 26 you can get +30 Radiation Resistance, which will help fend off Rads quite nicely. Even one or two stars in this Perk can help. Stock up on RadAway and Rad-X. This can get expensive, so you’re better off raiding other people until you have a sizeable stash rather than buying from vendors. Equip stuff that protects against Rads. Protection against Rads is signified by the small radioactive symbol on a piece of equipment’s stats. The higher the number beside it, the more you’re protected against Rad buildup. It’s important to note that radiation protection usually means sacrificing on other defensive areas. 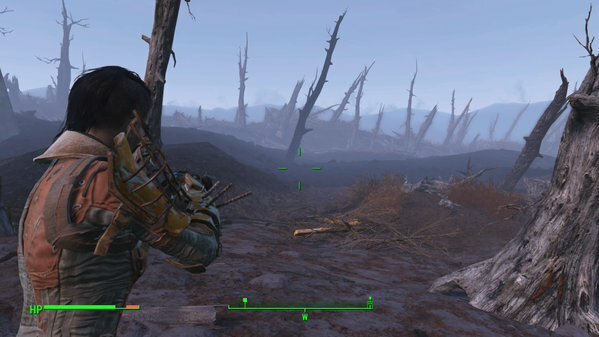 Get some Power Armor. The chances are extremely good that you’ve found at least one suit of Power Armor by now, and these suits will protect you against Rad buildup. (If not, you probably haven’t visited Concord’s Museum of Freedom, or encountered the Minutemen. Yikes.) You can wear a Hazmat Suit under Power Armor and pretty much guarantee that your trip will go swimmingly. The big problem here is the need for Fusion Cores, which are somewhat rarely found and cost a pretty penny if bought from a vendor. If you don’t normally use Power Armor, though, you should already have enough in your inventory to get you through the Glowing Sea. All prepped? Then head out. You’ll know the Glowing Sea when you get there, because, as its name hints, it glows. You’ll see it at night from a loooooong ways off. The outskirts of the Glowing Sea in Fallout 4. It only gets more fun from here. The trip from Goodneighbor back to Diamond City is fun on its own, Super Mutants, Ghouls, Raiders, and Gunners patrol the streets and try to make your life miserable. Yay! On the flip side, the Brotherhood of Steel will occasionally zoom in on a Vertibird and shoot up whomever you’re fighting, so you won’t always have to take these creatures on alone. From Diamond City you’ll have to veer southwest. You’ll find a quicker route out of the hectic city blocks by going directly west along the first major road to the south - though this will force you to go through the Mass Pike Tunnel, which is filled with Raiders and Ghouls. Not a long trip, but potentially bloody. It, on the other hand, you head to the smaller, southern bridge, you’ll pretty much have to swim, as the bridge is stuck in a bad position from this side. It’s a safer trip, and if you have Rad-resistant gear already the water’s no problem, but still. A short ways southeast of the Scrap Palace is the Somerville Place, a small homestead you can recruit as a Minutemen settlement. If you haven't discovered it yet, head there now. It's probably the closest safe location you can use to fast travel to the Glowing Sea. This will allow you to retrieve Power Armor and other supplies for the trip safely. Past here the trees start to thin out considerably, and you’ll know you’re headed the right direction when the waypoint abruptly jumps to the veeeeery corner of the map. Welcome to the outskirts of the Glowing Sea.